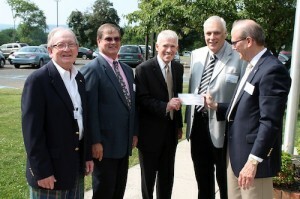 From left, Larry Thornton, past grand knight; David E. Adams, trustee; Steve Proctor, Matheny president; Robert J. Warren, financial secretary; and Harry Vernon Smith, grand knight. Adams, Warren and Smith are residents of Bridgewater, NJ; Thornton lives in Gladstone. 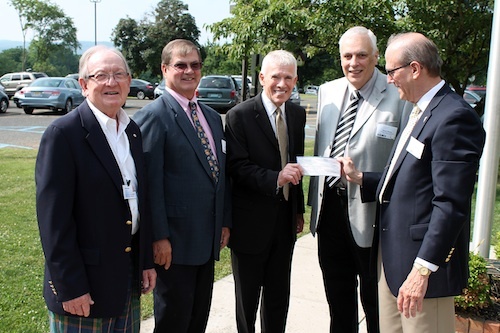 The Knights of Columbus Council 5959 at Blessed Sacrament Catholic Church in Martinsville, NJ, is known for its generosity and support of nonprofit organizations and causes. On July 2, four members of Council 5959 visited Matheny to deliver a check for $1,594.80 to Steve Proctor, Matheny president. Matheny is a very grateful that we are one of the groups receiving the Knights’ support. In addition to Matheny, the Knights aid such causes as feeding the homeless, providing coats for the needy and sending packages to men and women in uniform. This entry was posted in Uncategorized and tagged Blessed Sacrament Catholic Church, Knights of Columbus Council 5959. Bookmark the permalink.